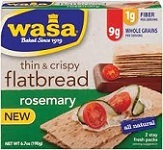 Wasa Flatbread specializes in thin, whole grain crackers. 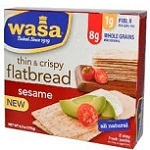 See 55+ Wasa Flatbread Reviews and save an extra 10% on Wasa Flatbread with Coupon Code* YAG250 at iherb.com/Wasa-Flatbread?rcode=YAG250. 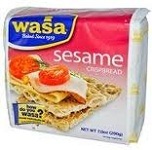 Nutrition: Serving 14 g, Calories 60, Fat 1.5 g, Carbs 9 g, Fiber less than 1 g, Sugar 0 g, Protein 0 g.
Ingredients: Wheat flour, sesame seeds, water, yeast, canola and palm oil, sugar, salt. Contains wheat. May contain traces of milk. Nutrition: Serving 11 g, Calories 35, Fat 0 g, Carbs 9 g, Fiber 2 g, Sugar 0 g, Protein 1 g.
Ingredients: Whole grain rye flour, rye flour, water, yeast, dry sourdough, salt.